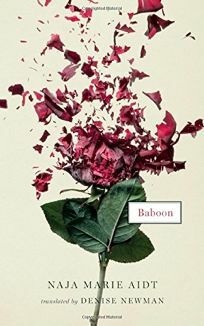 There’s nothing terribly likeable about the characters in Baboon, Naja Marie Aidt’s collection of short stories. Relationships are at the core of the stories but the situations Aidt explores in each of the 15 tales is often unpleasant; child abuse, the breakdown of a marriage, sexual assault, discordant siblings, mental and physical illness. Yet there is something disconcertingly fascinating about the bleak snapshots. A reader’s guilty voyeurism. In The Interruption, for example, a stranger forces her way into a young man’s apartment and refuses to leave. In Candy a man launches a wild and ultimately humiliating tirade in a shop after his wife is arrested for shoplifting. In The Green Darkness of the Big Trees a man crushed by depression finds relief by looking up at the thick woodland canopy. Aidt’s writing is angular and spare. Often she uses a chronological, sometimes almost minute by minute recounting that gives you the feeling of being a bystander trying not to watch as events unfold, but finding it impossible to look away. At other times the reader is lulled by the slow descriptive lushness of scenery and nature. In a recent interview Aidt said that she never really plans the plot but “basically I sit down and write when I have an urge that I cannot overlook.” This may be a key to the fact that occasionally the reader is left with an almost surreal feeling, as if some important point of understanding is hovering just out of reach. But overall, Baboon is an absorbing collection, provocative and decidedly unsettling. Naja Marie Aidt is an award-winning Danish writer who has published nine books of poetry. Baboon is her first full-length collection in English translation. It is translated by Denise Newman and is published by Two Lines Press. It is on the shortlist for the PEN prize for a work in translation which will be announced in May.